Along with the evolution of the broadband network and digital audio equipment, information rates for delivery and storage have increased rapidly owing to the demands for high-quality audio signal (high sampling rates, high word resolution, and multichannel capability). In the broadband environment, we do not want to lose any quality as a result of data compression. However, as long as the original quality remains unchanged and the processing cost is low, compression will always be useful because the information rates might exceed the available transmission speed or storage capacity. To meet these demands, we have developed a lossless coding scheme that assures perfect reconstruction of the original waveform. This is essential for storing or transmitting high-quality signals without any degradation in a cost-efficient manner. We have continually contributed to the establishment of a lossless coding standard in the MPEG community since 2002. The standard (MPEG-4 ALS) was published in 2006 as part of ISO/IEC 14496-3. Since the publication of this standard, we have continued to make efforts to further improve the encoder and for commercialization. 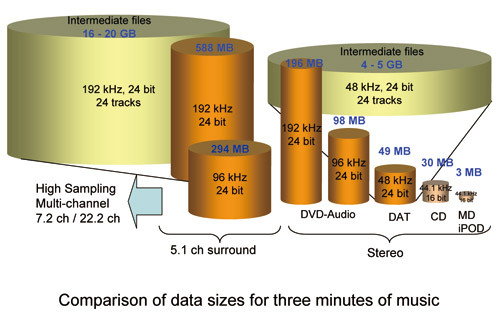 Various formats of high-quality audio signals can be compressed into 15- to 70 % of their original size by using lossless compression technology. 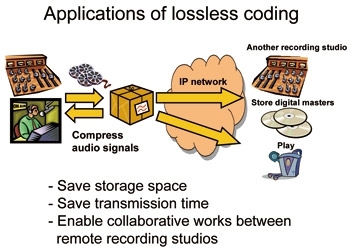 The technology enables many kinds of services, such as, audio data transmission among remote recording studios, long-term preservation of master recordings, online music stores for high-quality music contents, and music contents storage in consumer electronics equipment including PCs. 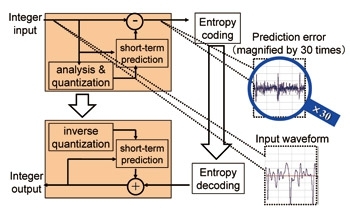 In addition, the technology can be applied for other kinds of time-series sequences. Bio-medial signals and signals from sensor arrays can be compressed by the technology so that those data can be easily handled. We hope that the internationally standardized technology will be used in many application domains throughout the world and over time. MPEG-4 Audio Lossless Coding (ALS) is an international standard that losslessly compresses audio signals in an efficient manner. The ALS core codec is based on forward-adaptive linear prediction, which offers remarkable compression performance with low complexity. Additional features include long-term prediction, multichannel coding, and compression of floating-point audio material. ALS also offers good flexibility in terms of the compression-complexity tradeoff, ranging from very-low-complexity implementations to maximum compression modes, so it is adaptable to different requirements. Lossless audio coding technology will be widely used for compressing various multichannel signals, such as wave-field-synthesis, bio-medical, and seismic signals, as well as surround audio signals. To improve the compression performance for these multichannel signals, adaptive subtraction from reference channels with weighting factors is applied. This process is based on the interchannel dependence of the time domain prediction residual signal. Actually, ALS can reduce the file size of non-audio data, such as magnetoencephalography (MEG) data and electrocardiography (ECG) data, efficiently by exploiting interchannel redundancy. We have proposed an efficient scheme especially for a floating-point sequence. A mathematical scheme in higher arithmetic, called rational approximation, is applied. A common factor can be estimated with approximation even though there some error factors exist in the input samples. When there are remainders, the remainders are efficiently compressed with masked-Lempel-Ziv coding. This scheme is extremely efficient, especially when the input floating-point sequence is constructed by multiplication of the sequence of integer values and a gain factor in the editing operation. 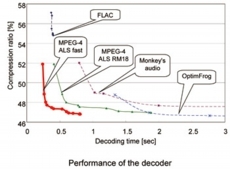 Since the MPEG standards only defines the bit stream and the decoding process, we can introduce ways to enhance the encoding algorithms and implementation even after its publication. 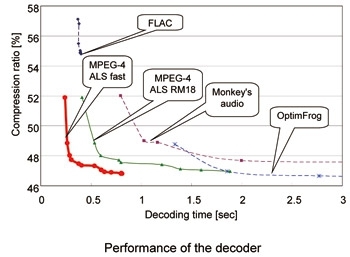 We have tried to enhance the encoding and decoding process of the ALS, while ensuring that the bit streams and the decoded results remain compliant with the MPEG standard. The figure on the right shows the compression performance of an MPEG-4 ALS decoder developed by NTT. The processing times of the encoder and the decoder are less than 1/100 of the playing time of input signals.